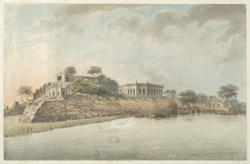 Watercolour of fort at Dalmau from 'Views by Seeta Ram from Benares to Nazibghur Vol. III' produced for Lord Moira, afterwards the Marquess of Hastings, by Sita Ram between 1814-15. Marquess of Hastings, the Governor-General of Bengal and the Commander-in-Chief (r. 1813-23), was accompanied by artist Sita Ram (flourished c.1810-22) to illustrate his journey from Calcutta to Delhi between 1814-15. The fort at Dalmau is situated on the north bank of the Ganges river between Kanpur and Allahabad. Located on a high cliff, the fort was constructed on the ruins of two Buddhist stupas as early as the 14th century. Sultan Ibrahim Shah of Jaunpur (r.1402-1440) restored the fort and constructed a garden and a well on its site.